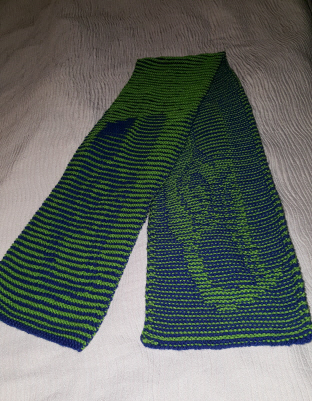 I have been illusion knitting for 6 years and about 3 years ago ran across the Woolly Thoughts site for illusion knitting. I purchased the eagle shawl and loved making the project. I needed a gift idea for my husband and since he's a big seahawks fan I wanted something he could sport around town that no one else had. I contacted Mr. Plummer and he helped design the pattern for me using an idea I had pictured in my mind and a logo I had for another project. He sent me the pattern template and it turned out perfect. With his time and help I was able to wow my husband and give him something unique and special. 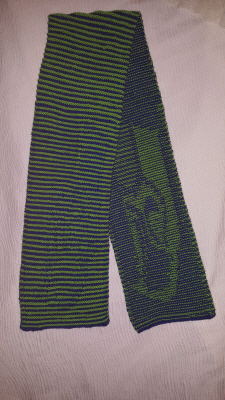 Now all our friends will be asking for their own seahawks scarf. I thank Mr. Plummer for all his time and help. Without his help I would not have been able to achieve this goal. I love the Woolly thoughts site and I refer a lot of people to it to show all the possibilities of the craft.